If you noticed the UC Irvine Student Center buzzing with even more youthful energy than normal the evening of Nov. 21, here’s why: The Donald Bren School of Information and Computer Sciences was hosting AppJam+, which meant that about 100 Orange County middle school students were showing off their very own educational Android apps. 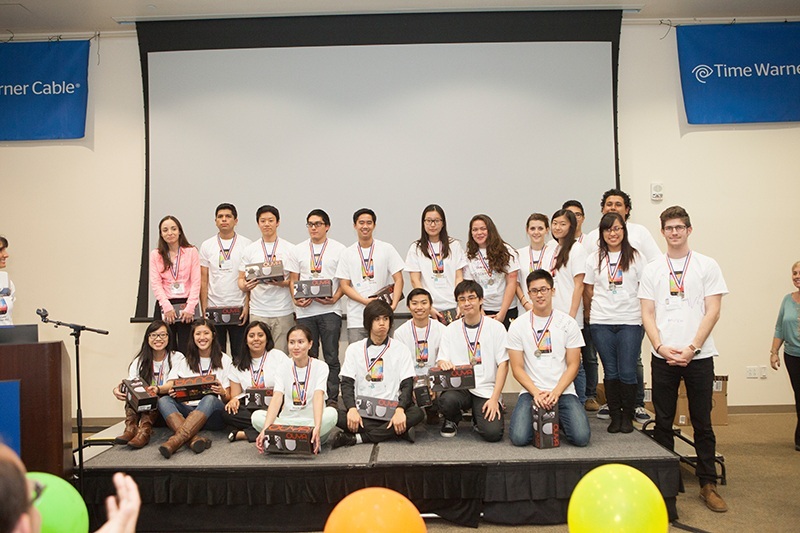 The UCI undergraduates gather for a group photo at the AppJam+ showcase. 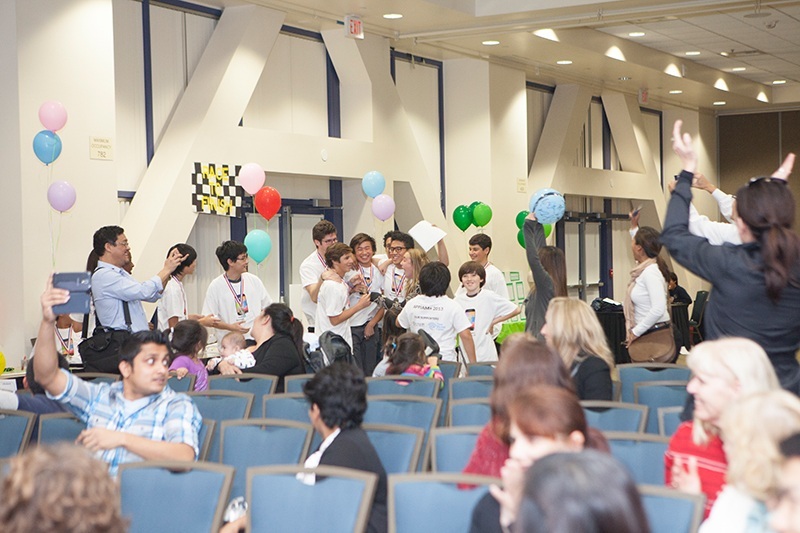 Sponsored by the Orange County STEM Initiative and Time Warner Cable’s Connect a Million Minds initiative, the AppJam+ program gives middle schoolers a chance to work in teams to build a piece of software on a deadline — with the help of UCI undergraduates as mentors. Judging by the whoops, hugs, cheers, T-shirt signings and general jumping up-and-down, this year’s AppJam+ easily achieved its goal of inspiring middle school students to learn about STEM (science, technology, engineering and mathematics) fields. “Even though they were all competing against each other, they all were cheering for each other, too,” noted CJ Calderon, director of OC STEM. She added that it was encouraging to see the event stir such enthusiasm. “It doesn't get better than seeing kids excited about STEM,” she said. The showcase marked the end of a long technological journey for these girls and boys. Beginning in September, the middle school students and their UCI mentors gathered twice a week for about two months to build their mobile apps, using the simple App Inventor platform. The after-school workshops took place at five sites: Tiger Woods Learning Center in Anaheim; Harbor Day School in Corona del Mar; Girls Inc. in Santa Ana (which met at Santa Ana College); Boys and Girls Club in Garden Grove; and Tarbut V’Torah Community Day School in Irvine. Last year’s inaugural AppJam+ consisted of about half as many students at two locations. The middle schoolers collaboratively brainstormed ideas for their mobile app in teams of three to six people, each with its own UCI mentor. Each app had to be designed to teach a math or science concept to elementary school students. Mentor Daniel Tenorio works with the AppJam+ students at the Boys and Girls Club of Garden Grove. Wesley Chong of the Tiger Woods Learning Center and his mentor, Stephanie Eng. At the showcase, each team set up a table for judges and others to come by and try out their apps. The teams also demonstrated their apps on stage. Wesley Chong, a member of the Tiger Woods Learning Center’s team that dubbed itself Miscellaneous Remuneration, gave one of the more engaging demos of the evening as he described his team’s haunted- house themed game. “There are zombies, so obviously, the only way to defeat them is with math questions,” he declared. The event ended with an awards ceremony, and the four teams that got called up on stage to receive their prizes got progressively louder and more boisterous. Fourth place went to the BIG DEEALS from the Boys & Girls Club of Garden Grove for their math shooting game, “Galaxy Raiders.” Third place went to Tarbut V’Torah’s Fiyaa! for “Breakout,” in which players have to use their math and science skills to escape a school’s evil teachers. RADDAS Games from the Tiger Woods Learning Center came in second place with “Solar Space Brigade,” which teaches facts about the solar system. And the winners were … Team Swag from Harbor Day School for “Infection Protection,” which helps fifth graders learn anatomy while tackling mini-games in which players prevent infections from harming the body. John Torres and Team Swag of Harbor Day School celebrate their big win.